"Look at my eyes. I'm dead behind these eyes. I'm dead. Just like the whole damn shoddy lot out there." Laurence Olivier is Archie Rice, The Entertainer, struggling to keep his vaudeville career alive in London against a rising tide of television, movies, and more talented competition. An undischarged bankrupt, he can't even write a check in his own name without risking imprisonment, and he hasn't paid income taxes in two decades. While his current production sinks, he continues cheating on his wife Phoebe, (Brenda De Banzie), ignoring the advice of his daughter Jean (Joan Plowright), and trying to live up to the legacy of his father, music hall legend Billy (Roger Livesey). Even when his soldier son Mick (Albert Finney in his debut role) is taken prisoner in the Suez conflict, Archie is unable to devote as much attention to his family as he does to his floundering career. 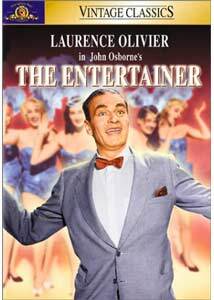 The Entertainer was based on John Osborne's play, and its best moments are rich with language and emotion, delivered by Olivier and company in highly theatrical style. Olivier has a field day with Archie's stage persona, singing and dancing awkwardly and delivering horrendous jokes, with pain and desperation just below the surface. Unfortunately, the story itself has serious flaws and few sympathetic characters. Archie is a scoundrel, a philanderer and a liar; he's not talented enough for us to love him in spite of his flaws, nor human enough to touch us as a tragic figure. Joan Plowright (who married Olivier shortly after this film was made) is well-meaning but ineffectual as his social-worker daughter Jean, while Brenda De Banzie generates volume but little genuine emotion as Archie's put-upon wife. Roger Livesey has a lot of fun as the aging Billy Rice, but the soundtrack recording technology of the time obscures many of his best lines. Director Tony Richardson does what he can with the material, giving his talented cast plenty of room and time to work onscreen, but there isn't enough substance here to merit the effort. The Entertainer plays as "situation tragedy," with some tolerance for humanity and humor as long as everything comes out strident and conflicted in the end. It's the sort of drama that struts and frets its hour upon the stage, impressing the matinee crowd without leaving much of a lasting impression. Image Transfer Review: MGM presents The Entertainer in its original 1.66:1 theatrical aspect ratio, letterboxed within a nonanamorphic 4:3 frame. I'm not normally a stickler for anamorphic enhancement on 1.66:1 titles, but in this case it would have been a better solution, as the frame is so fully employed that the edges of the credits will be lost to overscan on most displays. The transfer is otherwise quite impressive, with crisp black & white detail and well-balanced shadows, although some gate wobble and occasional damage detract from the experience. It's a solid transfer given the age of the unrestored film. Audio Transfer Review: There was a period in the 1950s and '60s when British films fell far behind their Hollywood counterparts in terms of audio technology, and The Entertainer is unfortunately no exception. "Live" dialogue recorded outdoors is almost always muddied and obscured by background noise, frequency range is heavily clipped, and even the studio scenes suffer excessive hiss and distortion. It's a shame, because many throwaway lines and important aspects of the performances are lost to poor recording quality; English subtitles would have been a valuable addition here, but are nowhere to be found. The DVD transfer isn't necessarily at fault, but this is one of the worst soundtracks I've heard on a non-public-domain, major studio release. Extras Review: There's nothing to look at here, just 16 picture-menu chapter stops and subtitles in Spanish and French (not English, unfortunately). The Entertainer is a well-acted but muddled drama that doesn't mean as much as it seems to insist it does. MGM's DVD features a sharp-looking transfer, though the audio is poor and supplements are non-existent. Not recommended, though it may be worth a look to see Olivier at the top of his form.